Australian architecture firm Bates Smart has revealed a concept for a 45,000-seat stadium, which would be built above Central Station in Sydney. Bates Smart designed the concept stadium as a city-centre alternative to the New South Wales State Government's plan to rebuild the city's existing Sydney Football Stadium at Moore Park. According to the firm, placing the stadium above the station would tie the sports venue into the city, in line with the increasing trend for modern stadiums to be built in central locations. "Today a renaissance is underway, with stadiums once again being integrated into the city fabric and acting as catalysts of urban renewal," said Philip Vivian, director at Bates Smart. "Stadiums, such as Camden Yards in Baltimore and Docklands Stadium in Melbourne, are anchors for entertainment districts and have reintroduced urban spectacle into our cities." Placing the facility directly above the station would also, of course, give the stadium extremely good public transport links. It would also link the two parts of the city currently divided by the station's train tracks. "We propose that Moore Park Stadium's replacement be built over Central Station's rail yard; creating the benefits of public transport accessibility, catalysing the development of the rail yards to connect Surry Hills to Chippendale, and having broader economic benefits for the state, the city and surrounding neighbourhoods," added Vivian. 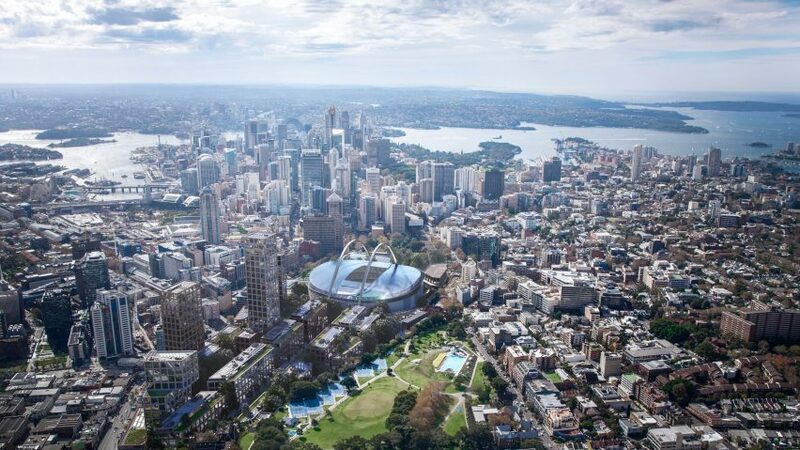 Bates Smart's proposal is meant as an alternative to the New South Wales State Government's plans to demolish the Sydney Football Stadium, which was designed by Cox Architecture and opened in 1988. The practice is set to design a replacement stadium, costing AU$ 705 million, on the same site in the suburb of Moore Park. According to Bates Smart, the central alternative is preferable to the governments's plans because Moore Park is not very well serviced by public transport and does not have numerous entertainment and hospitality venues nearby. Near Central Station, Düsseldorf-based Ingenhoven Architects and Australian practice Architectus are building a 79-storey skyscraper that is set to become the city's tallest building.